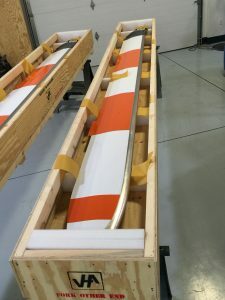 Upgrade to Composite Main Rotor Blades! 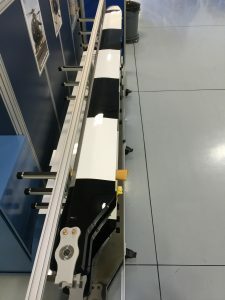 The VHA 206B main rotor blades use the same carbon fiber materials and construction methods as our successful 206B/L tail rotor blades, which have been available as an STC/PMA aftermarket component since 2009. Both blades feature carbon fiber skin and spars, an efficient NASA-designed laminar-flow airfoil, and tapered tip. The corrosion-resistant composite design contains stainless steel and nickel abrasion strips that cover the entire length of the blade for erosion and lightning strike protection. 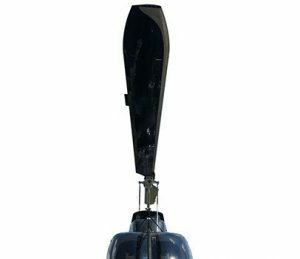 A single trim tab facilitates the track-and-balancing process. The VHA blades use the identical installation configuration as the OEM blades, allowing direct replacement without hub modification. Certificated by the FAA in 2016, VHA 206B main rotor blades are now flying in more than a dozen countries on four continents. Some customers are reporting overall aircraft speed increases of 3-5 kts using the VHA main and tail rotor blades. Since our blades are different by design, there are a few differences with installing and flying our blades. For more information, read our 206B Main Rotor Blade READ ME FIRST document. – Each set shipped with trim tab zeroing tool, set of tie downs, and two blade crates. 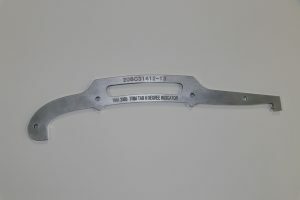 Trim tab bending tool (206-CS-T001) may be ordered separately. Our VHA 206B main rotor blades are shipped in balanced pairs. However, static and dynamic balance may be performed in the field in accordance with VMM-MR-206B-501 Instructions for Continued Airworthiness (available on our Documents page). Each main blade contains one trim tab for easier track and balance. However, many operators find they need little to no adjustment of the trim tab. Also, we recommend adjusting pitch links prior to adjusting the trim tab. For more information, read our 206B Main Rotor Blade READ ME FIRST document. VHA has developed trim tab bending (206-CS-T001) and zeroing (206C31412-13) tools to assist in track and balance procedures. 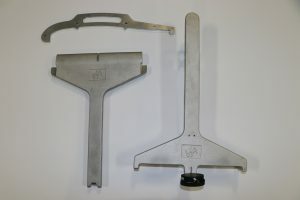 Alternatively, any 206B tab bending and angle measuring tools may be used. For more information and PDFs of paper charts that can be used to balance VHA 206B main rotor blades, click here. To view a how-to video about adjusting the trim tab, click here. The first full-scale prototype was completed on February 27th, 2013 for display at 2013 HAI Heli-Expo, with an updated blade design displayed at the 2014 Heli-Expo. Baseline flight testing using OEM metal main rotor blades and VHA tail rotor blades occurred from October to December 2014. 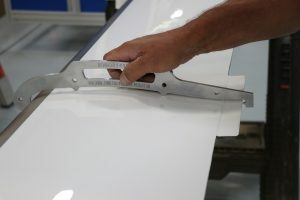 The first flight test blades were manufactured October 2014. First ground tests and hover tests occurred on December 10. Flight testing continued through December 23, 2014. During this flight testing, the engineers determined that the blade design required a little tweaking due to mild vibration at certain airspeeds. Otherwise the blades flew well, and test pilots flew several patterns with the composite blades. After a slight design change, flight testing resumed in February 2015 with a new set of blades. Flight strain survey and acoustics testing were completed in April 2015. 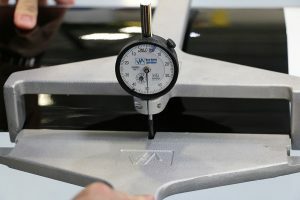 VHA received FAA Type Inspection Authorization (TIA) in June 2015, shortly after which the company began fatigue tests. The fatigue tests included testing of the blades, hub, control system, and other components. After fatigue testing completed in January 2016, all of the data was compiled and certification documentation was submitted to FAA. VHA 206B JetRanger blades received FAA STC in February 2016 and Transport Canada STC in October 2016. They are now available to our customers for purchase through Aeronautical Accessories.